MDG Advertising thrives on giving back to the community and contributing to organizations that make a difference. While the personal and professional fulfillment of helping a charity is all the satisfaction we need, we were proud and touched to receive the Spirit of Giving Award for our pro bono creative work for the Bobby Resciniti Healing Hearts Foundation. This worthwhile organization offers a haven for healing called Bobby’s Place where families dealing with the loss of a child can meet, share, and support each other as they face a fate that no parent should know. This foundation holds a special place in our hearts, as it was created by the parents of Bobby Resciniti as a tribute to the son they loved and lost. Today, it stands as a comforting source of help, healing, and hope for families seeking some semblance of peace. 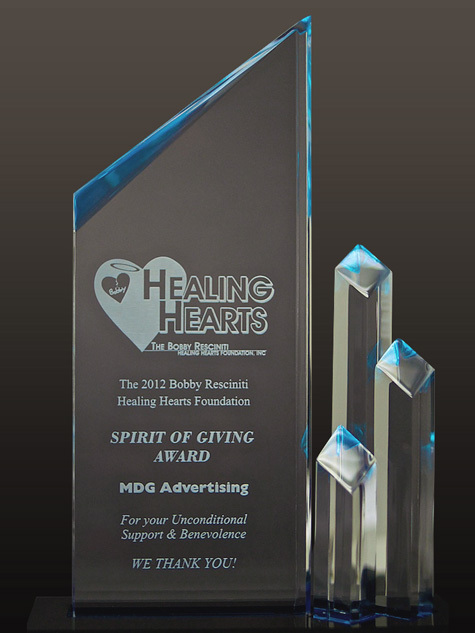 MDG was presented with this significant award at the 6th Annual Bobby Resciniti Healing Hearts Foundation Charity Dinner held in early November in Coral Springs, Florida. In addition to the awards presentation, the sold-out event featured dinner, a variety of entertainment, silent and live auctions with proceeds benefiting the foundation, raffles, and a moving video montage of the young “Angels” who were taken too soon. MDG is proud to have been honored with the Spirit of Giving Award and looks forward to continuing our tradition of helping organizations committed to helping others. At MDG, a full-service traditional and digital marketing agency with offices in Boca Raton and New York, NY, our 360° marketing approach uses just the right mix of traditional and online media to reach your marketing goals. While some industries may fare better in print and others online, we strive to create a balanced approach where traditional and digital marketing efforts support each other and your message is tailored to the medium. To stay on top of the latest marketing trends that will make an impact for your brand, contact MDG Advertising.